[Robert Jordan | Banner] Daniel Westholm, junior business administration major, defends the ball in a match against Point Loma Nazarene University Sept. 22. The team defeated the Sea Lions 3-0 at home. 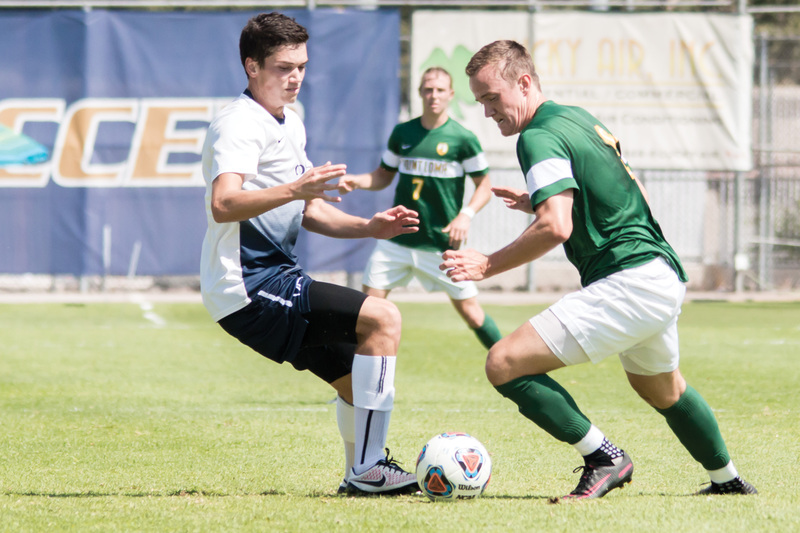 The men’s soccer team at California Baptist University is well into its season as the men currently have a 5-3 record. Their most recent match at home was a conference game against Azusa Pacific University. However, the Lancers came up short in a 2-1 loss. Coe Michaelson, head coach of the men’s soccer team, said he and his team set goals before the season started. Michaelson also said he hopes the team qualifies for the national tournament. Michaelson said they hope to improve from last year’s 10th place finish in the PacWest Conference. “Obviously if we are hoping to challenge for conference titles or the NCAA tournament, then we drastically improved from last year,” Michaelson said. Luca Tschaidse, junior kinesiology major and forward, said the soccer team has substantially grown this season. Tschaidse also said the team always has chances to improve. The team will continue its season with its next home game Oct. 20 against Notre Dame de Namur University. The team will face PacWest opponents in the remainder of the season in preparation for the NCAA Division II West Regional Tournament Nov. 10-12. The team currently holds the No. 11 spot in the PacWest Conference rankings with three points.